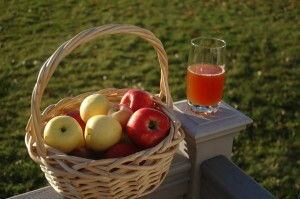 Fresh cider, apple juice or sweet cider. Anyway that you name it, it is truly a sign of the fall harvest. This year my wife bought a cider press from Happy Valley Ranch. We have our own small apple orchard, so we were planning on pressing apples from the backyard. However, when you have a nice cider press, you start looking around for other sources of free apples. Tina has a friend that has a large apple tree in their front yard. For the most part these apples get tossed to the horses. When Tina hold her friend that we had a cider press, the next thing that I knew, we had 7 bushels of apples in our garage waiting to be turned into cider. Two weekends ago we processed enough apples to press about 14 gallons of apple juice. This weekend we picked a pickup truck load of apples. We pressed about 30 gallons. Most went into the freezer, but some was consumed fresh and 6 gallons when to my friend, Andy, for some hard cider. I remember as a kid that there were a few houses that we would go trick-or-treating to that had fresh cider. I can now understand the pleasure of sharing a cup of fresh cider. I don’t think that I an quite ready to try to bring that tradition back for trick-or-treat, but many of my neighbors will look forward to cider season. Nice cider blog. Makes me wish I had a good apple tree or two to make my own cider. Next time you are in the Valley, contact me. If I have a gallon in the freezer, it’s yours.